Bed And Breakfast269 sq. ft.
with a width of 25 square meters, can accommodate a maximum of 2 people, is characterized by the exclusive furniture and the comfortable king size in anallergic material. 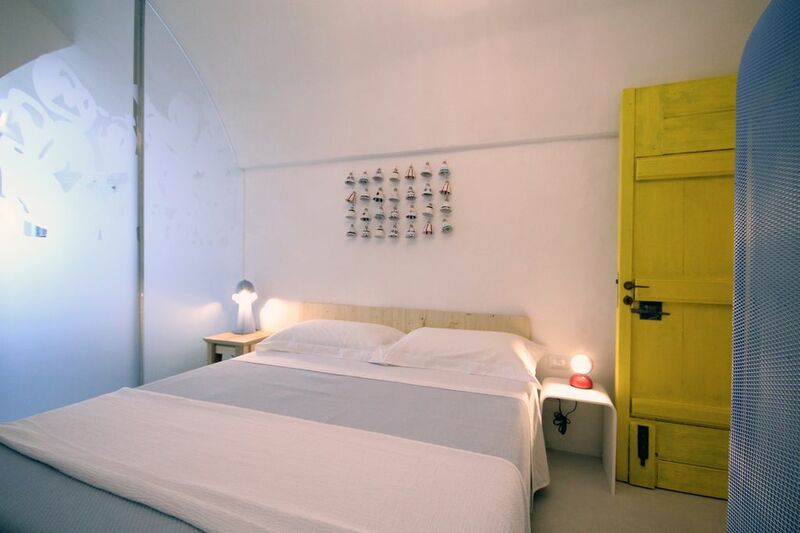 Equipped with a spacious bathroom with shower, hairdryer, toiletries, minibar with fresh drinks and exclusive organic toiletries. La Dimora di Caterina, an ancient peasant house dating back to the 1500s, is a point of reference for the prestigious historical center of Ugento, a renowned tourist destination in Salento, recognized as a city of art for its architectural, archaeological and environmental beauties. Exclusive place where the silence is interrupted by the sound of the bells of the nearby Cathedral, where design meets tradition, welcoming and giving the guest a stay of well-being and relaxation. Ugento, the ancient "Uxentum", surrounded by olive trees, was a center of importance in Messapic and Caposaldo in the southern territory of Salento. It still retains the remains of the Messapic walls (IV century BC) and numerous finds that can be seen at the archaeological museum. Walking around the charming old town is still breathing today, the air of a past time that lives in the walls, churches and alleys. Its navies are: Torre San Giovanni, Torre Mozza and Lido Marini. It is renowned for its sandy coastline, which reminds a lot of Caribbean beaches, with a very small number of rocks in some stretches, and for several artificial basins, dotting the landscape to the hinterland, mixing with imposing and beautiful olive trees.